EISA Mozambique contributed to the capacity of district magistrates in managing electoral disputes. More than 200 Justice officials, including district court judges, district prosecutors and police officers from all districts where there are municipalities (except the 13 districts in Maputo province and Maputo city) were trained between 16 November and 19 December 2017 in matters related to election dispute management and electoral crimes. 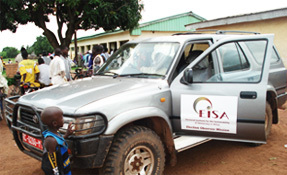 In July 2004, EISA opened an office in Maputo, Mozambique to assist the electoral stakeholders in Mozambique. The project was developed against the background of the election disputes of the 1992 and 1999 general elections in the country. As result the project activities focused on election-related conflict management. One of the objectives of the project waws to contribute to the promotion of transparency by the CNE and STAE ito achieve more credibility in the management of the electoral process and thereby to build trust amongst stakeholders and reduce areas of conflict between them. The objective was achieved by by engaging them in constructive dialogue. Three workshops were organised in Inhambane, Quelimane and Pemba in collaboration with the Electoral Observatory. The fact that EISA brought together in a single course CNE/STAE, parties and CSO representatives made possible an interaction between individuals with different roles in the electoral process and proved to be an opportunity for open discussion and mutual understanding amongst stakeholders. Facilitation of discussions with similar stakeholders around the conflict management mechanism was undertaken with the participation of experts from South Africa who came to share their experiences in setting up an election-related conflict management mechanism in their own country. The Electoral Observatory was one of the most important electoral initiatives of Mozambican CSOs and its relevance had been demonstrated during the local government elections of 2003. EISA therefore decided to engage in a more active partnership with the Electoral Observatory and give it support in long term observation and conflict monitoring and in conducting electoral processes monitoring operations such as Parallel Vote Tabulation. In terms of conflict monitoring, EISA helped the Electoral Observatory set up registration forms and created a basic database to to accumilate information collected by observers. Training of representatives of the National Electoral Commission (CNE) and its secretariat (STAE), civil society organisations (CSOs) and political parties on democracy, elections and conflict was undertaken. A train of trainers course was held in Maputo for 18 prospective trainers drawn from different stakeholders. These 18 people who went through the programme were subsequently deployed to the 10 provinces where they trained a total of 178 trainees drawn from CSOs, parties and STAE. The trainees were equiped with the skills needed to act as mediators in electoral conflict situations.